If you run into an issue where Quarantine reports are not being delivered, use the screenshots below to make sure you have the correct options enabled. 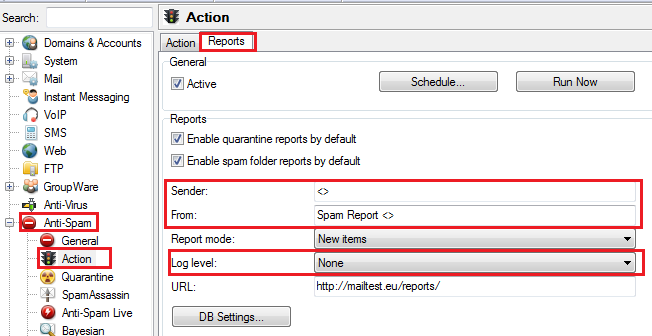 Make sure that Enable quarantine reports box is ticked, and that the Sender and From fields are properly filled out, otherwise the emails come from a blank address. Also change the Log Level should not be set to None. After all these things are setup properly, check through your quarantine list and see if you see emails coming from an address like <>@127.0.0.1 with a subject of "Quarantine Report". If you do see them in your quarantine, then allow them to be delivered. Once this happens you should see the reports come through, and any future reports should work after this correction. You should see a script run and it will tell you a report about what accounts were updated and if there are any errors to report. At the very end you should see OK. 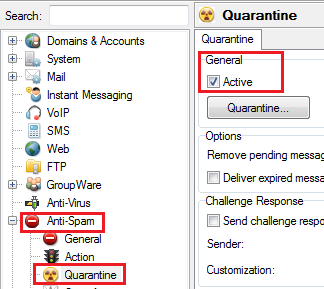 If you see errors or do not receive quarantine reports to the accounts that have mail in the quarantine list, then contact support with a link to view the challengelist.html and we will see what else can be checked.